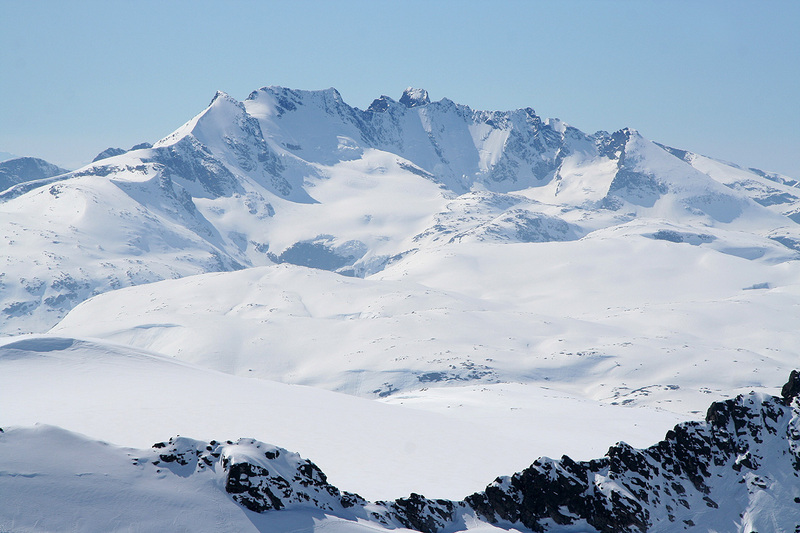 How to get there: This mountain is located on Sognefjellet. The very nice road (Hwy.55) connecting Luster (west) with Lom (east) normally opens late April or early May. Good starting points are the DNT hut Krossbu or the Sognefjellshytta located slightly further west. Driving time from Bergen is about 5 hours. 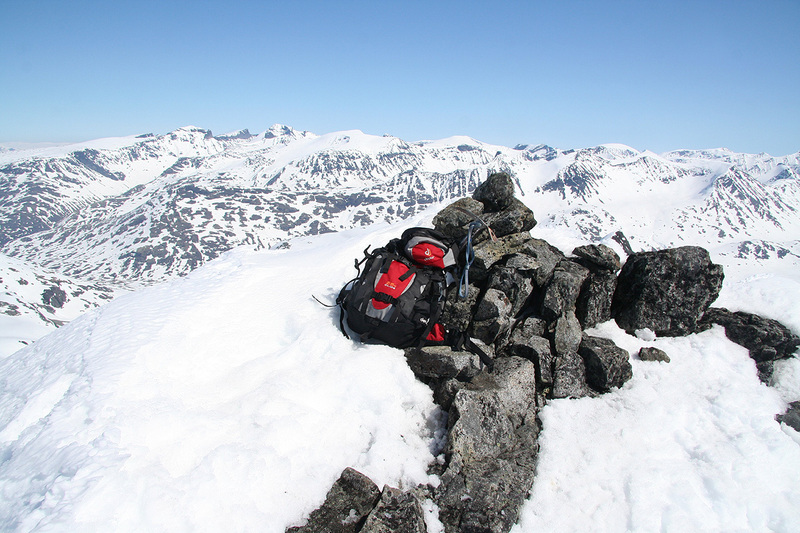 Sognefjellshytta is located at N61:33.906, E007:59.877, elevation 1416 meter. 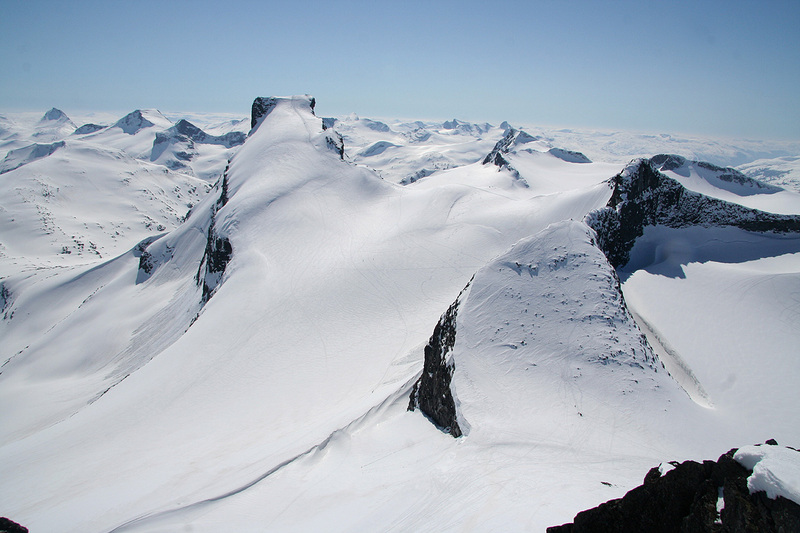 Route description: First, see the description for Storebjørn. 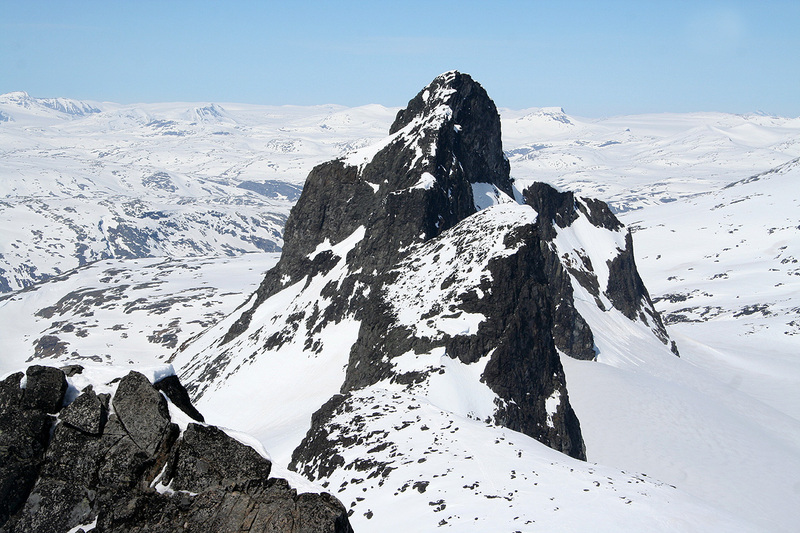 From the key saddle called Bjørneskaret, first climb the lower part of the ridge extendig upwards to Saksi. 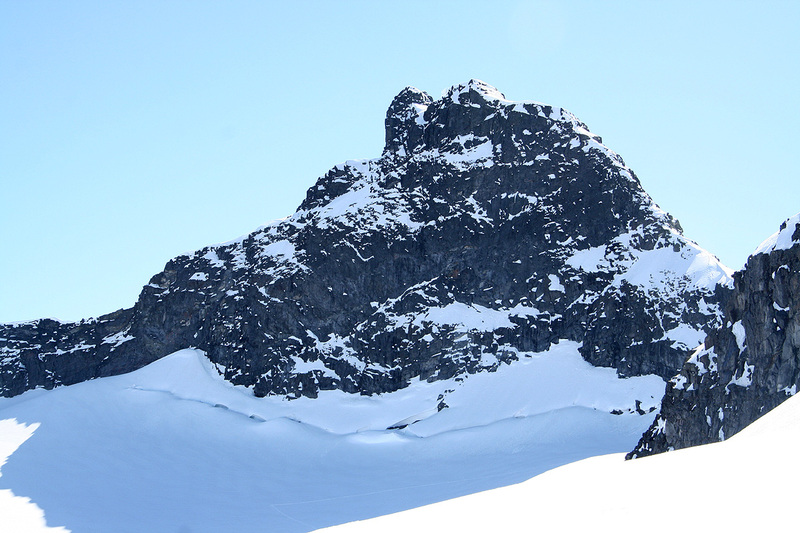 You will (often) meet some rocks on this ridge, they can be circumvented either left or right. 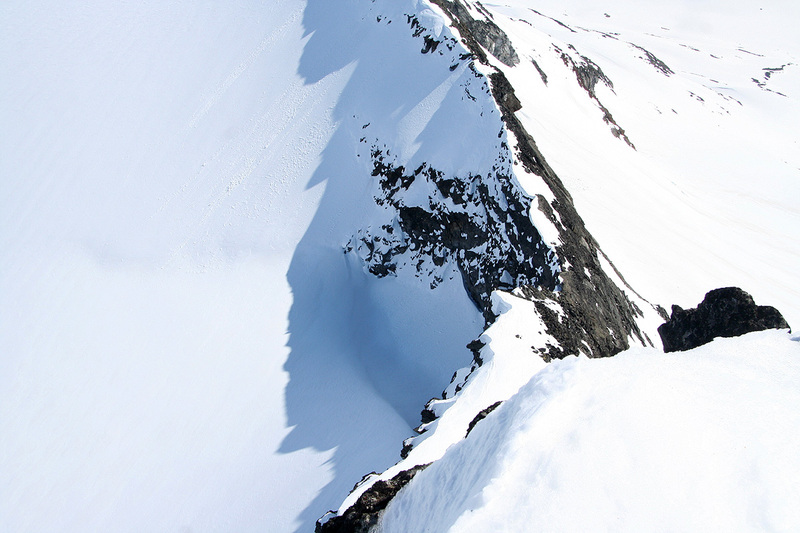 From the higher part of this ridge, traverse on moderately steep snow into the very distinct gully further left. Follow this gully until it tops out between the two summits. 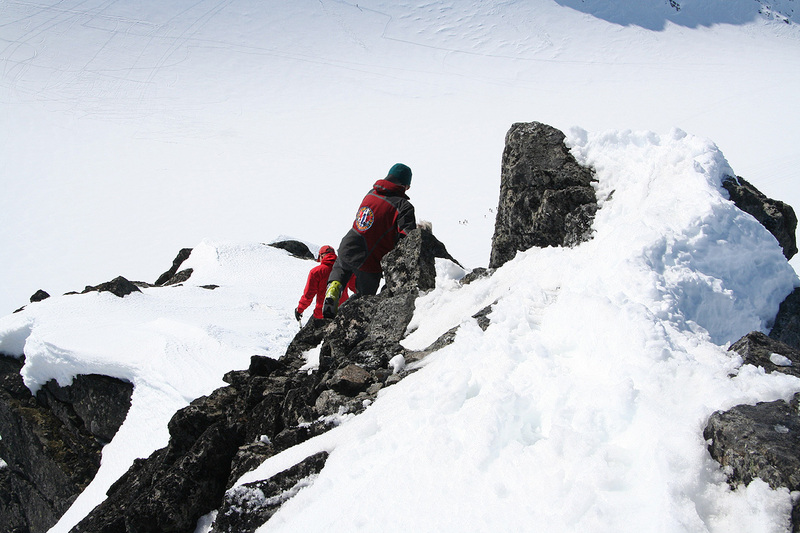 Climb right, then traverse a bit right in order to easily reach the nice summit. Comments: I arrived at this very nice summit around 1300, just as another party was about to descend. Thus, I got the summit all by myself and decided to stay there until the next group of climbers would arrive. One could sit high up on this sharp peak and look at all the busy activity on all the other peaks as well as on groups of people in transit between the peaks. Today, was most likely the very warmest and best day for skiing up here all spring. Eventually, a new group came up the gully and to the summit. It was my turn to leave and let the new arrivals have the summit for a while. I left around 1330, I had wondered about how to get to the north side of Store Smørstabbtinden, the view from Saksi convinced me that I could ski on the "backside", ie. the east side of the peaks. This was the third peak climbed on this near perfect day. I proceeded to climb Store Smørstabbtinden. Saksi, as seen from the north. Storebjørn, as seen from Saksi. Kniven and Store Smørstabbtind, as seen from Saksi. View northeast from Saksi. Illåbandet with Vesle Galdhøpiggen behind. Skarstind (with Nåla) on the left. 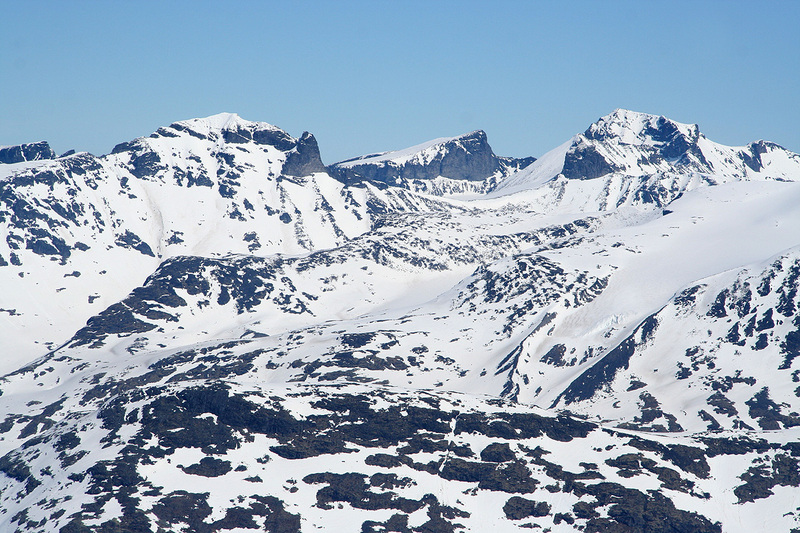 Storjuvtind and Galdhøpiggen on the right. A sharp ridge extending from Saksi. 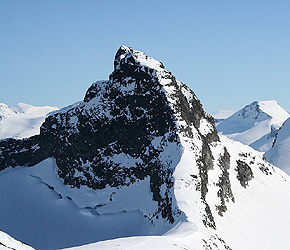 Styggedalsryggen and Storen seen from Saksi.